Unamo's SERP Screenshots are fully interactive HTML screenshots of the SERPs that we saved when fetching your rankings from Google. They are perfect for sending definitive proof of rankings to teammates and clients as image files or screenshots. SERP Screenshots are updated daily and display rankings for every URL ranking for a specific keyword. They are available for both desktop and mobile results. Keywords Section: Once enabled, SERP Screenshots will appear in a column in your keywords table. Individual Keywords: In your individual keyword section, you can access your screenshot in the top, right-hand corner. By clicking on the screenshot icon, you will be redirected to a new window with 100 results and your website highlighted in blue. To the left, you can view its rank position. The screenshots are fully interactive HTML pages, meaning that all the elements are clickable as they would be on a normal SERP. They are also downloadable. You can export them as .png files by clicking on the icon in the top, right-hand corner. Please note that we highlight all your pages ranking within the first 100 results in the case of multiple pages ranking for the same keyword. You can tell if you have more than one page ranking by looking for an alternative URL next to the SERP link in your keywords table. Historical Data: If you've purchased this add-on feature, then you can view historical screenshots of your rankings over time. Simply select the date picker in the top, right-hand corner and choose a date to see past rankings. 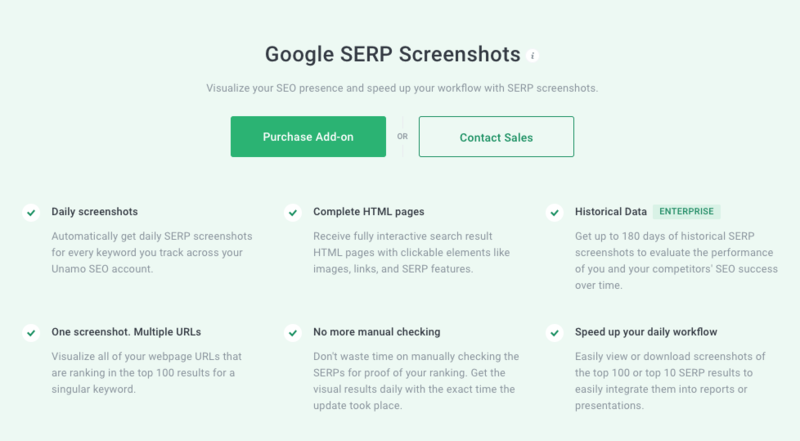 Simply click the + sign to access a dedicated SERP Screenshots Landing Page with more information and the ability to purchase. You can also add SERP Screenshots from the hub Pricing and Products Section. At the bottom, find the Daily and Historical SERP Screenshots features and add them to your account. In case you need assistance with setting up SERP Screenshots for your account, don't hesitate to connect with us via chat or directly at support@unamo.com!